Noodle Run is a set of two delivery side missions in Grand Theft Auto: Chinatown Wars. 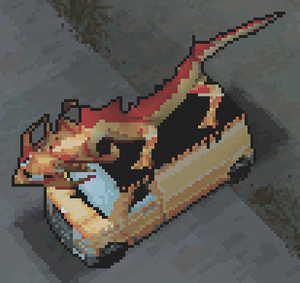 The side mission is automatically activated once the player enters one of two Dragon Wagon delivery vans in the city. Depending on which Dragon Wagon they enter, the side mission will take place exclusively in East Island or Algonquin. The mission tasks the player in delivering noodles to various customers throughout the noodle businesses' sphere of operation within a limited time limit (typically 2 minutes), requiring the player drive to the destinations, walk up to the customers' doors to "ring the bell", wait for the customers to walk out, and then establish contact with a customer to complete a delivery. For each round, customers will be clumped within a specific district, providing some ease in completing the mission. During the first round, players need only delivery two orders to two customers, beginning the second round, however, players will have to complete three deliveries in one go. The player progresses to the next round once the last delivery of the current round is complete and the player reenters the Dragon Wagon. In addition, hostiles from the rival Noodle Exchange will appear from the second round onwards to disrupt the player's delivery, driving maroon/brown Bobcats to intercept the player's van or open fire at the player when they are on foot. In the beginning, the rivals are only armed with Pistols, but upgrade to Uzis starting the fourth stage. Killing the rivals drops their weapons and regularly a bullet-proof vest. The player is awarded a bronze medal once they complete 8 deliveries, silver for 12, and gold for 15 or more (East Island), and bronze for 8 deliveries, silver for 10 and gold for 13 or more (Algonquin). If the player attains gold medals in both the East Island and Algonquin Noodle Runs, they will attain health regeneration if their health falls under 25%. Using the regular Shotgun for this odd job is most effective, as any other weapon will attract police attention. This page was last modified on 19 September 2010, at 15:06.